If you’re reading this, you probably need a replacement cable, since your system originally came fully equipped. You may know your part number, so are ready to send us your P.O. Perhaps your part number has worn off and you are using our cable guides to find the correct replacement cable; once you establish what it is, you can also send in the P.O. to us. Or, you might give our customer service reps and service technicians a call so we can walk you through the information we need to find the right cable for you. Identifying the cables by color (blue or green) and configuration (2-wire or 5-wire interfaces) is vital for proper selection. As an example: 2-wire probes use the green socket. 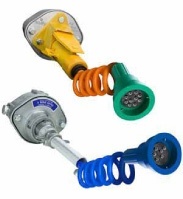 Duoceptâ outputs give you the capability to use either socket; the truck electronics allows both outputs. 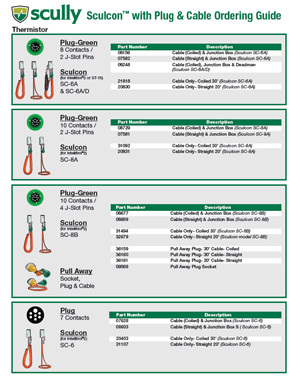 Any specialties may require further questions to qualify your cable needs. We start with the basic identifying characteristics, then pick the proper cable from there. What color is your existing plug? How many pins are there for j-slots? Do you need a straight or coiled cable? Is it hard wired or a pull away cable? Most often, we field these questions for people looking for replacement cables at the terminal. If you are trying to address a truck set-up, then we ask the questions in the opposite vein. For example: what kind of cables are at the rack? 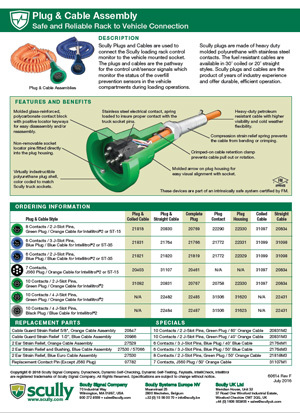 Click on the Plug & Cable Guide PDFs to download! Scully plugs and cables are used to connect the Scully loading rack control monitor to the vehicle-mounted socket. The plugs and cables are the pathway for the control unit/sensor signals, which monitor the status of the overa­ll prevention sensors in the vehicle compartments during loading operations. Scully plugs are made of heavy-duty molded polyurethane with stainless steel contacts. The fuel-resistant cables are available in 30' coiled or 20' straight styles. Scully plugs and cables are the product of years of industry experience and offer durable, efficient operation. Molded glass-reinforced, polycarbonate contact block with positive locator keyways for easy disassembly and/or reassembly. Non-removable socket locator pins fi­tted directly into the plug housing. Virtually indestructible polyurethane plug shell, color coded to match Scully truck sockets. Stainless steel electrical contact, spring loaded to insure proper contact with the truck socket pins. Heavy-duty, petroleum-resistant cable with higher visibility and cold weather flexibility. Compression strain relief spring prevents the cable from bending or crimping. Crimped-on cable retention clamp prevents cable pull out or rotation. Molded arrow on plug housing for easy visual alignment with socket. These devices are part of an intrinsically safe system certified by FM. Scully Signal Company has over 30 years of electronic liquid handling experience providing the ultimate dependability, service, and safety. Call us at (800) 272-8559 if you need help selecting your replacement cable.